Offering affordable treatment and monthly payment plan options to all of Orange County. Paying for dental treatment is an important part of receiving quality dental care. We want to make sure that you always know the cost of treatment before starting any dental work. Plus, we work with you to come up with affordable payment plan options when needed. At our office we accept cash, checks and all major credit cards in addition to Apple and Samsung pay. Personal checks are accepted under certain circumstances as well. We accept all PPO dental insurance plans as well as many HMO plans. As you know, dental insurance only covers a small portion of treatment. Understanding insurance co-pays, deductibles and benefits can be somewhat confusing. We will do our best to help you better understand your dental insurance benefits. Furthermore, we will work with our patients to help maximize your reimbursement from the insurance company. How can you help me afford costly dental treatment? We understand that caring for your oral health should be a priority. We don’t want finances to come in the way which is why we gladly offer monthly payment plan options. 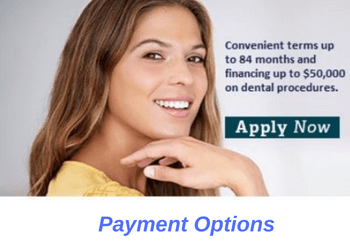 These payment plan options are available for all treatments costing above $500. Our monthly payment plans are offered through reputable third-party finance companies such as LendingClub and Alphaeon. These are low-interest or no-interest monthly payments. The interest rate depends on how many months you’d like to extend your payment as well as your credit score. Also, there is never any prepayment penalty for paying off your treatment early. If you’re interested in learning more about monthly payment plans, give us a call today. Contact us by calling (949) 481-2540 or book your appointment online. Applying for healthcare financing is quick and easy and only takes minutes to complete. Plus, your initial application for healthcare financing is always a soft credit check which doesn’t impact your credit score. Should you qualify, we will present you a few different payment options to see what works best for you. Call us today to achieve the smile of your dreams in less time than you imagine!